I have had an exceptional year. I wrote about my schools graduation… and the next day we attended the high school graduation of our friends’ son. Now I have had graduations also in the family. At the end of last year my husband graduated as a Master of Political Sciences and a month ago my daughter became a Master of Science. My husband works in marketing and when he was young he attended a school of economy which probably is very similar of college. Our system is very different compared to USA. I never went to college but straight to the university where I studied only mathematics, physics, chemistry and information technology. The school of economy did not however lead to the Bachelor’s degree and my husband decided to get the degree now when the children were adults and he had more time to use to himself. The graduation ceremony in the university has changed over the times. Earlier it was called the promotion ceremony and it took altogether 3 days including a parade, a wreath, white long gown, a ball etc. The promotion ceremony took place after longer periods and the last one was held just when I had started the studies. When I got my degree the promotion did not take place any more and soon after that the whole system changed. Nowadays the ceremony in the University of Turku takes place twice a year separately in every faculty and it is called Publicum. It lasts only for about two hours with some speeches and the new Masters receive roses. My husband could not attend the ceremony last December and that is why he had it in June. Here are some pictures from the ceremony. We had celebrated the event between family earlier, having dinner together in a restaurant. No festivities took place after the publicum because of that. Here are some pictures from the event. Now that my daughter got her degree, she missed this spring’s date by a couple of weeks and attends the ceremony in autumn. Also this time we celebrated the new Master having dinner in a boat which travels through the archipelago beside Turku and we had a delicious dinner in the boat. The weather was just fabulous! The last effort in the degree is the master’s thesis, which we call “pro gradu”. 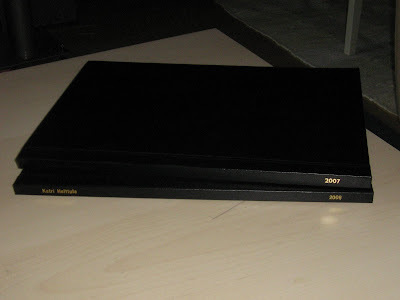 The thesis is put in hard covers. Here is a picture of both of them. I also took a picture of my daughter’s thesis. Here major was mathematics and people have been asking how the thesis is written :) Her title was “One-way permutations in cryptography”. 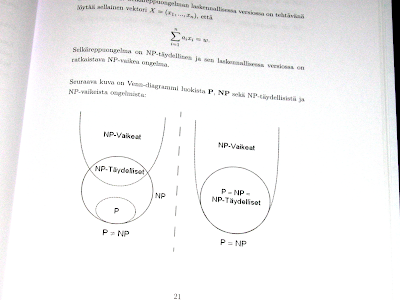 My husband’s title is impossible to translate straight in English (at least for me) but it was something like “The Theory of Adam Smith’s Invisible Hand combined with Chaos Theory”.